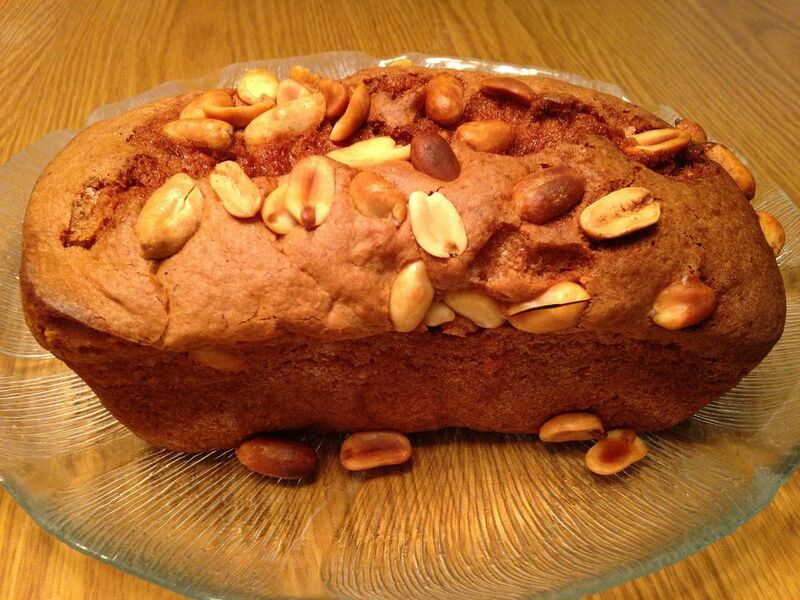 This bread is also called Elvis Presley bread, because he was a huge fan of that peanut butter and banana combination. It is a tasty combination. I like mine cold from the refrigerator, and spread with soft butter. If I end-up eating a piece, or two, of this for breakfast I spread it with whipped cream cheese. That way I’ve added some protein into my meal. Preheat the oven to 350 degrees F. Grease and flour 2 - 9" by 5" or 4 – 5” x 3” loaf pans. Coarsely chop 3/4 cup of the dry roasted peanuts and set aside. Mix the flour, sugar, baking powder, salt and baking soda with a wire whip. Cut in the butter with a pastry blender or two knives cutting in a scissors fashion. Add the peanuts and stir around enough to coat them in the flour mixture. In a medium sized bowl, combine the mashed bananas, peanut butter and eggs. Stir the mixture until all is combined. Add the banana mixture to the flour mixture. Still the batter until all is just moistened. Divide the batter between the 2 (or 4) pans. Tap each pan on the counter to help level the batter. Sprinkle remaining, un-chopped nuts on top of the batter prior to baking. Bake for the breads for 50 minutes to an hour for large pans and 30 minutes for the smaller pans. Use a toothpick to test for doneness. If the toothpick comes out clean, the breads are done. Cool them in the pans on wire racks for 10 minutes. Carefully remove the Banana Peanut Butter Breads from the pans and completely cool them on wire racks. Once they cool, they should be wrapped in foil and placed in an airtight bag. Like all quick breads, they taste better the next day. I like to freeze at least one loaf for later. They also make excellent gifts. Just add a bow. If the bread is refrigerated, the peanuts on top tend to get soggy. The top peanuts are not necessary. They are really just there for looks. I always have coconut in my freezer, which makes this bread easy to make. You can make this bread anytime. Canned pumpkin is kept in stock year around in most grocery stores. This is an interesting bread. It begins with a starter that can be shared among your friends.